The Monster Energy skateboarding team hit Europe for this year’s edition of the CPH Open competition. For the first time in its storied history, the grassroots skate event was held at three stops: Copenhagen, Denmark; Amsterdam, The Netherlands; and Berlin, Germany. Over 150 top pro skateboarders from across the globe – including riders from Argentina, Chile, Denmark, France, Spain, Italy, Norway, and the United States – are on board for the unique skate tour. Starting CPH Open 2018 on a high note, Monster Energy team riders Ishod Wair and Kevin Baekkel claimed first place spots after posting heavy tricks at events all over Copenhagen. Their Monster Energy teammates Juan Carlos Aliste and Marek Zaprazny took second and third place, respectively, at the street session in Amsterdam. Known as the “The Champagne of Skateboarding,” the CPH Open is an annual spectacle attracting the best skateboarders from across the globe since its inception in 2007. A real “skater’s contest” that no pro wants to miss, CPH Open has created a winning formula by mixing traditional stadium skateboard competitions – for instance at Copenhagen Skatepark – with cash-for-tricks sessions at authentic street locations across the city. Presented by Monster Energy, this year’s three-city spectacle started on August 4 with a three-day stretch in Copenhagen, followed by an action-packed day in Amsterdam. 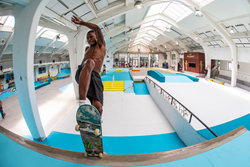 Kicked off on August 9, the grand finale in Berlin included an international street skateboarding competition at the Nike SB Shelter skatepark in Berlin on August 11, next to surprise events across the German capital. Going back to where it started, the CPH Open returned to its roots in the Danish capital where Wair already claimed first place in the street contest last year. Perhaps it’s something in the water in Copenhagen, but the city turns Wair into an all-out contest machine. At the Triangle concrete street spot, Wair landed backside heelflip to fakie and frontside bigspin fakie over the hip, 360 kickflip over the bump, frontside boardslide over the gap rail, crooked to nollie flip on the ledge, kickflip crooked fakie and backside tailslide on the extension to claim first place against some of the world’s best street skaters. Wair also ruled the street session in Downtown Copenhagen with backside Smith grinds on the tall picnic table and cleared the cobblestone street gap with a switch heelflip. At the newly rebuilt Copenhagen skatepark, Wair floated huge frontside kickflips on the quarter pipe and also popped a lofty kickflip over a stacked palette of beer cans from a kicker in a closed-off city street in front of a massive crowd. Speaking of crowds: At each of these stops around the skate-friendly Scandinavian city, the action drew hundreds of spectators in a festival atmosphere. A major highlight included the Independent Trucks 40-stair Rail Session in counter-culture hotbed Christiania. This is where Monster Energy’s Baekkel laid down the winning best trick of the day with a 40-stair frontside 5-0 grind down the burly rail. The epic session also saw Monster Energy teammate Dario Matarollo from Argentina land a frontside lipslide down the rail for third place. The weekend also included a raging bowl session for the 20th anniversary of legendary ALIS Wonderland indoor park, where Baekkel found the right lines to drop hammers for a second place finish. During Saturday’s halfpipe session, Monster Energy’s Sam Beckett dug into his versatile bag of tricks, including head-high backside 540s and kickflip backside lipslides. He was joined by Monster Energy teammate and Copenhagen skateboarding icon Rune Glifberg, who showcased his technical finesse with heelflip frontside airs and one-footed Madonna airs. Once Copenhagen was a wrap, the caravan of international top pros hit Amsterdam. A basic set-up of kickers and benches at Eerste Weteringplantsoen Park by the canal provided the kind of grassroots backdrop for true street talent to shine. Chilean Monster Energy team rider Juan Carlos Aliste hit the benches in a line featuring nollie heelflip noseslide and backside nosegrind shove-it, earning second place in a stacked field of riders. His compatriot Stavros Razis landed backward nosegrinds and switch 5-0s. Slovakian team rider Zaprazny brought tech moves like fakie kickflip nosegrind, nollie nosegrind and nollie 180-kickflip fakie nosegrind to the jam for a strong third place finish. Wair handled the set-up with finesse and moves such as backside 5-0 revert into a fakie ollie switch frontside crooks, while European team rider Phil Zwijsen from Belgium pulled a creative slappy to crooked and switch frontside Smith grinds on the benches. The session at legendary Marnix Bowl saw Wair win the prelims by working the entire park with tall frontside stalefish tweakers to tail bash and backside crossbone airs over the hip, backside bigspin disasters, frontside feeble grinds, frontside ollie blunts, backside noseblunts and blunt kickflips to fakie. Monster Energy’s defending champion Baekkel boosted tall lien airs to tail bash in the deep end, and proved a force to be reckoned with in the infamous death race at NOORD skatepark by easily taking home the win. A real “skater’s skater,” Wair is known for attacking any type of terrain – from streets, to bowls, to skate parks – with effortless style. The winner of Thrasher magazine’s coveted Skater of the Year award (2013), Wair started his 2018 season on a strong note by dropping a critically acclaimed video part endorsing a new signature shoe for Nike SB. Although a back injury held him back in recent Street League Skateboarding and X Games competitions, the 26-year-old from Bordentown, New Jersey is officially back on track in Europe. Find more information on http://www.monsterenergy.com and follow Monster Energy on Facebook, Instagram, Twitter for exclusive updates.